Are you experiencing mild weight gain, hot flashes or menstrual irregularities? If so, these may all be early indicators that your hormones are in flux and you may be in the stage known as perimenopause. What is Perimenopause & When does it Start? So what exactly is perimenopause? You can think of perimenopause as a transition from normal menstrual cycles to menopause (1). We can break down the word to define it a little bit better. The prefix "peri" means about or around and the word menopause refers to a state of ovarian failure (or reduced hormone production). So perimenopause means the time around or about menopause. Every woman will go through 3 main stages during her reproductive life. During this phase, you will be ovulation on a normal basis, usually monthly. This is when your hormones are cycling normally and your body is producing an egg with each ovulatory cycle (2). This phase lasts generally for as long as you have available eggs. This is the phase commonly referred to as perimenopause. During menopause, your body will be producing hormones in a cyclical nature around the time of ovulation each month. The transition phase refers to changes that occur in this cycle as your body runs low on eggs. During the transition phase you may have more anovulatory cycles, your cycles may become more irregular, they may be heavier or lighter in flow and so on. This change occurs directly from changes in hormone levels that tend to slow down as a woman ages. We know that starting around age 35 both progesterone and estrogen will naturally begin to decrease (3). As these hormones decrease they cause changes in the normal menstrual cycle. 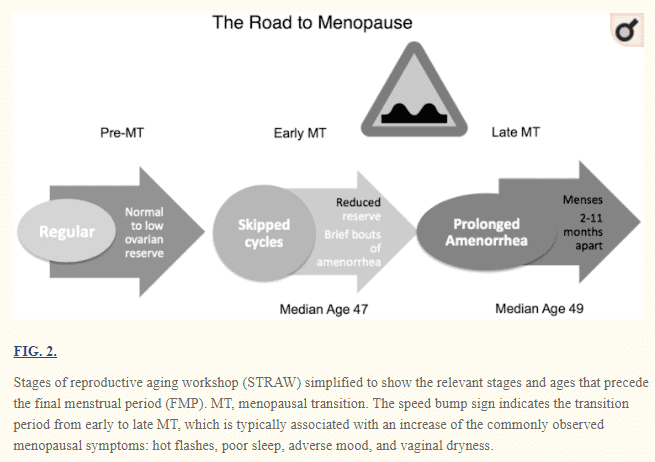 These changes eventually lead to stage 3 which is menopause. Menopause is the state in which your ovaries "fail" and are unable to produce the same amount of estrogen and progesterone that your body was capable of producing during normal menstruation. Menopause is accompanied by serious symptoms (you can read more about them here) which are the direct result of changes to these hormones. Whenever you make changes, even slight changes, to the hormone levels in the female body, serious changes tend to emerge. This is why both perimenopause and menopause often carry with them important signs that can tip off the woman. But when does Perimenopause actually start? Believe it or not the age is not well defined, partly because we have a hard time nailing down the exact definition of perimenopause. The typical age that women experience perimenopause may be around age 40, but it can definitely start in the 30's as well. The length of time that perimenopause lasts largely depends on the individual. The best way to determine how long you will be in perimenopause, or when menopause is likely to start for you, is to ask your mother when it happened for her. In many ways, the symptoms of perimenopause can be more frustrating than menopause. The issue with perimenopause is that your symptoms may come and go, stay for a few days, completely go away for another few weeks and so on. This constant changing in symptoms is directly associated with changes in estrogen and progesterone levels in your body. We know that women do not go directly from normal menstruating to complete menopause, instead, they gradually experience this shift over months to years (4). This shift or transition is the perimenopause phase and it is associated with some key symptoms. You'll notice that these symptoms tend to mimic the symptoms associated with menopause, but usually to a lesser degree. And this makes sense if you think about it because both conditions are caused by the same problem (a reduction in hormones), the only difference is that perimenopause is not quite as severe because you still have some hormone production (5). One of the most concerning symptoms associated with perimenopause is that of weight gain. It is well known and documented that both menopause and perimenopause are associated with weight gain in many studies (6). In some cases, physicians attempt to contribute this weight gain to changes in appetite or an increase in food consumption. This doesn't hold true for many women who experience weight gain during perimenopause and menopause without changing how much they exercise or what they eat. We can, therefore, make the assumption that the changes in hormones (drop in estrogen and progesterone) are at least in part responsible for this increase in weight. It has been shown that the drop in estrogen and progesterone may increase the risk of developing abdominal fat (weight in the belly). Other studies have shown that hormone replacement therapy can help blunt or block this extra weight gain from occurring (7) (read more about therapies below). Managing this weight gain is very important because extra weight contributes to depression and other issues such as an increased risk of cardiovascular disease later in life (8). Ensuring that you go into perimenopause and menopause with your hormones balanced and at a normal weight is the BEST way to avoid this extra weight gain. Women who are already overweight or struggling with thyroid disease and other hormone imbalances will have a more difficult time losing weight after menopause. Is it possible to test for perimenopause? The answer is yes, but not as definitively as you can test for menopause. The problem with testing for perimenopause is that as hormones fluctuate, and as your symptoms change, it makes it difficult to pinpoint where you are at in your cycle and where your hormones fall in the larger picture. It's entirely possible for you to have a normal cycle 6 months out of the year and experience menopausal symptoms for the other 6. If you test your hormones during the "normal" 6-month cycle then your hormones will represent that. If you want to identify that you are indeed in perimenopause then you must check your hormones when you are experiencing those symptoms. The most sensitive test for this is the FSH which stands for follicle stimulating hormone (9). Due to feedback loops in the female body, FSH will rise during menopause and perimenopause in response to the drop in estrogen levels. Therefore, a high FSH can be an early indicator of perimenopause and menopause. Other hormones such as progesterone and estrogen can also be assessed (and should be assessed) as well. FSH - High FSH levels may be an early indicator of perimenopause. Progesterone - During menopause both estrogen and progesterone will fall and come close to zero. Estradiol - Estradiol, the most potent estrogen, tends to drop dramatically around menopause/perimenopause. Believe it or not, perimenopause may be more difficult to treat than menopause itself. The reason for this has to do with the fact that your hormones, during perimenopause, are constantly fluctuating up and down. This makes hormone replacement therapy very difficult. During menopause, your hormones are consistent in that they are always low or suppressed. This makes supplementation with bio-identical hormones quite easy. But during perimenopause, the use of hormones, especially estradiol/estrone, may cause temporary episodes of excessive hormones. For this reason, it's generally not advisable to use estrogen supplements during this time frame. This doesn't necessarily apply to progesterone, however. Progesterone tends to fall more rapidly, especially when compared to estrogen, starting at age 35. This means that supplementation with bio-identical progesterone is usually well tolerated when compared to estrogen (10). But there are other therapies, including supplements, that can be considered during perimenopause as well. Some supplements have been shown to have an effect on estrogen receptors which may help reduce the symptoms associated with the swings in estrogen (from high to low) during this time period. Progesterone - Progesterone is a hormone which is available over the counter and can be used to balance hormones during both menopause and perimenopause. The key to using progesterone is to mimic the natural cycle that would occur normally as if you were menstruating. This means using only a small amount of progesterone during days 14-28 of your "normal" cycle. This can be difficult, especially if you are experiencing abnormal cycles during perimenopause, but do your best to match supplementation with this rhythm. You can find more information on using progesterone safely in this post. Flaxseed - Flaxseed has been shown to reduce mild symptoms associated with menopause including hot flashes, it has also been shown in studies to help improve quality of life during this transition. Flaxseed might also help lower insulin and glucose and may help with weight loss during menopause/perimenopause (11). Black Cohosh - Black Cohosh is another supplement which may help alter estrogen levels by acting as a selective estrogen receptor modulator (12). What this means is that it may change the sensitivity of your cells to estrogen which may help reduce the severity of estrogen withdrawal (the principal cause of perimenopause/menopausal symptoms). Evening primrose oil - Evening primrose oil is another alternative to Flaxseed and Black cohosh in that it has also been shown to reduce hot flashes and improve quality of life (13) during the menopause transition. It's important to understand that these supplements may help your body tolerate the changes associated with perimenopause but they don't necessarily act as normal hormones in the body. The definitive treatment for menopause is hormone replacement therapy with bio-identical hormones, but this should be avoided during perimenopause (with the exception of progesterone). Perimenopause is a transitional state which will occur in all women at some point in their life. The exact time that it starts and the length of time that it lasts will depend on the individual and varies from woman to woman. Perimenopause is important because it signifies a change in hormone levels in the body and these changes in hormones contribute to the symptoms associated with perimenopause and even weight gain. Certain therapies, such as bio-identical hormones and supplements can be used to help manage these symptoms. You can also test for perimenopause by assessing estradiol, progesterone and FSH levels in the serum through routine testing. Are you suffering from the symptoms of perimenopause? Have you taken any supplements or hormones which have helped? Have you gained weight during this time? Which therapies have worked for you? Which haven't?